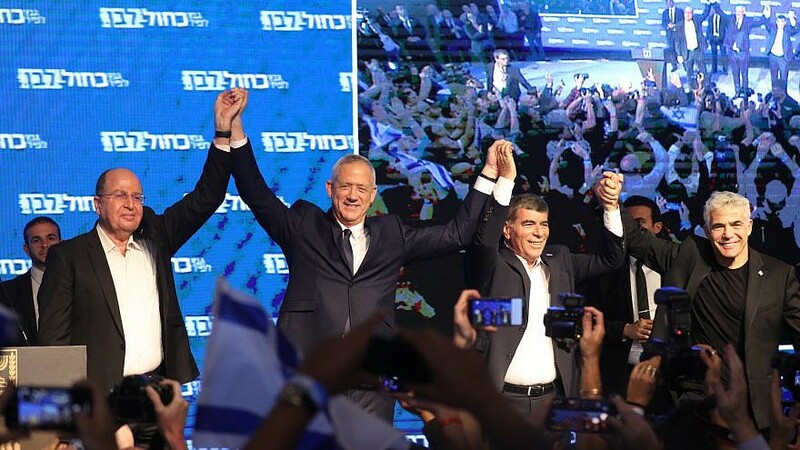 (April 9, 2019 / JNS) When the exit poll from Channel 12 appeared on the main screen of Blue and White’s election headquarters in Tel Aviv, showing 37 projected mandates for the party in comparison to Likud’s 33, cheers went up from campaign operatives on the floor. But the exit polls from Israel’s two other main channels showed widely varying results, with one tying the two parties at 36, and one giving Benny Gantz’s party an advantage of just one mandate. Then, the television analysts began attempting to piece together the picture that counts most: the size of each party’s bloc. Some suggested that Benjamin Netanyahu would have a better chance of forming the next government, while some floated the idea of a unity government. Amid all the uncertainty, however, Blue and White party’s headquarters, members and leaders interpreted the results as a cause for celebration. “My assessment is that we won,” Blue and White member Meir Cohen said as he headed into the headquarters building. Kozhinov highlighted the high number of projected polls as a key achievement. “We worked hard to reach this point,” he said. Professor Abraham Diskin, a senior fellow at the Kohelet Policy Forum, said the key factors that would become clearer in the coming hours are the edge parties that may or may not get past the minimum threshold, as the final votes are counted. The votes of Israel Defense Forces’ soldiers are also going to play an important role, he noted. “We don’t know the results yet; that’s the main thing. I really don’t know what is going to happen. But right now, Netanyahu looks like he is in a better position than Gantz,” said Diskin. He also pointed out that the television exit polls are based on a mere 30,000 people, meaning that they should not be taken as final numbers.